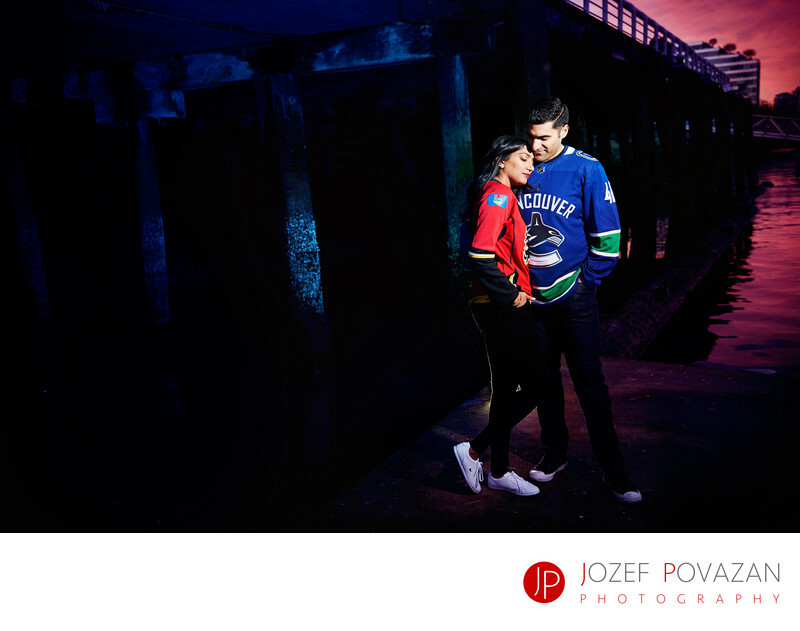 Vancouver Canucks and Calgary Flames NHL Engagement - Best Vancouver wedding photographer Jozef Povazan Photography studio. Vancouver Canucks and Calgary Flames NHL Engagement photographed by destination adventure wedding photographer Jozef Povazan. His Award winning photography concentrate on couples who would love to have different looking pictures and memories from weddings and engagements sessions. This T+F lifestyle engagement session took place at False creek nearby Science World. The couple is getting married at Ismaili Burnaby Centre and since both of them are fans of different NHL hockey teams they decided to have their team jerseys as a theme for the photoshoot. For this image multiple flashes with coloured gels were set around the pier to introduce dramatic lighting in teams colours red and blue. The edgy portrait shows the bride and groom in kind of game on face off and brings moody cinematic feel to the image. If you love creative and modern photography for your wedding then I would love to hear your plans and ideas and how we could put them together to create an awesome story in images for you. You can send us direct email or fill the form on our CONTACT page for more details. Location: False Creek, Vancouver, BC, Canada. Keywords: NHL Engagement (6), Vancouver engagement (30), Vancouver engagement photographer (6), Vancouver proposal (3).